While the full build-out of a new child care system in BC will take some time—as there are hard limits on how fast the necessary new spaces can be opened across the province and additional Early Childhood Educators trained and recruited to staff them—BC needs to move as fast as possible. Here are five steps the BC government can take in the February Budget to make this happen. There is no need to reinvent the wheel. The Community Plan, also known as the $10-a-Day Child Care Plan, should serve as the starting point. It is an evidence-based plan that provides a practical framework for transforming the existing patchwork of early education and child care services in the province into a universal, affordable and high-quality child care system that integrates early learning and care and is accessible to all BC families who want it. Their proposal to extend our public education system to cover early education and care is consistent with the large body of research from neuroscience and social sciences that shows just how critical the first few years of life are for brain development, health and lifelong learning. The Community Plan was developed by the Early Childhood Educators of BC and the Coalition of Child Care Advocates of BC, and since its release in 2011, it has been fine-tuned through a large, cross-province community consultation process. The Plan is now widely endorsed, including by community groups, non-profit organizations, businesses, social policy experts, local governments, boards of education and concerned citizens. 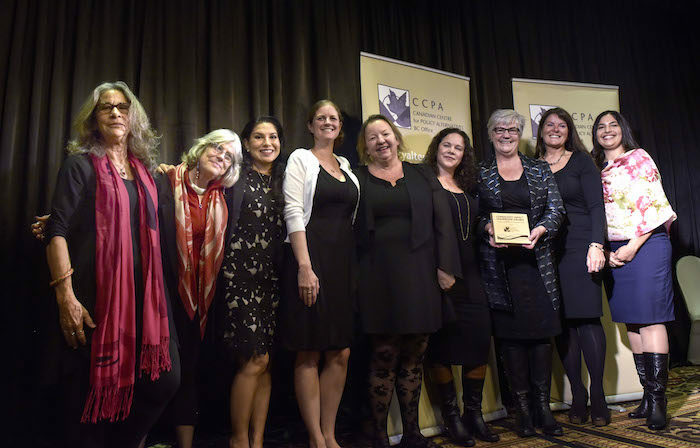 The Coalition of Child Care Advocates of BC receives a ‘Community Leadership Award’ at the 2017 CCPA-BC Gala, in recognition of their advocacy, education and policy development work on public, affordable child care for BC. Photo by Joshua Berson. All new child care funding provided in Budget 2018 should flow only to licensed programs that meet quality standards and accountability requirements, such as those recommended in the Community Plan. Enhancing the quality of all child care services is particularly important in light of the evidence. Both internationally and in Quebec, the research shows that quality programming matters a great deal. Yet, quality is where policy-makers have been tempted to cut corners in order to contain costs. In fact, Quebec’s provincial government’s failure to sufficiently invest in the quality of the child care services it publicly funds explains why some studies have found mixed results for educational or child development outcomes for Quebec children since affordable child care was introduced. (It is well-documented that family-based caregivers and full-fee private garderies in Quebec tend to provide lower-quality care than subsidized early childhood centres (CPEs)). Ensuring quality can be achieved by: setting evidence-based standards of service, staffing programs with well-educated early childhood educators, ensuring fair compensation, and strengthening monitoring and accountability mechanisms that are currently in place. The Community Plan outlines some of the measures necessary, including raising the educational standards for providers and providing ongoing funding for professional development and fair wages. To expand accessibility and improve the quality of child care programs, the BC government needs to fund more post-secondary spaces for early childhood educators and provide bursaries to unlicensed child care providers to help them become certified early childhood educators. All new child care funding provided in Budget 2018 should flow only to licensed programs that meet quality standards and accountability requirements. How much to charge parents has been the subject of much debate, but there’s no denying that the current fees are just too high. In 2016, the median annual child care fees for a toddler in Vancouver added up to $15,900—prohibitively expensive for many lower- and modest-income families, especially those headed by single mothers. Parent fees across the province have risen nearly three times faster than inflation over the last decade according to the BC government’s Annual Child Care Provider Profile survey (as we documented on p. 35 of this report). At a minimum, Budget 2018 should immediately freeze parent fees at current levels, eliminate fees for lower-income families and develop a strategy for reducing parent fees. We recommend aiming to reduce fees to $10 per day for full-time programs and $7 per day for part-time programs, starting with infants and toddlers (children three and under) over the three-year budget cycle, and phasing fee reductions in for preschool-aged children (ages three to five) and finally school-aged children over the next five to seven years. To make up for the reductions in parent fees, Budget 2018 should increase the Child Care Operating Fund grants to licensed child care providers accordingly. Extra funding must be allocated to ensure social, physical and cultural inclusion. Capacity planning must be done in collaboration with local communities, with a goal of making child care available for all families who would like to access the public program, whether full-time or part-time. Researchers working with the Coalition of Child Care Advocates of BC estimate that over 122,000 new licensed spaces would be required to make early education and child care accessible to all families. This would require ambitious capital investment in new facilities and funding to retrofit existing informal or unlicensed spaces so they could become a part of the new provincial child care system. Existing capital funding programs must be immediately expanded with the goal of bringing in a minimum of 22,500 new licensed spaces over the next three years and a faster ramp-up subsequently to fully implement the plan in five to seven years. This planning should be done with local school boards. 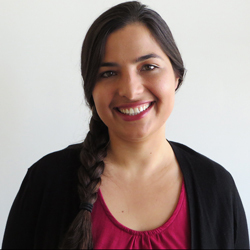 Resource and capacity planning for Indigenous child care and early learning on and off reserve must be done in partnership with local First Nations. Capacity planning must be done in collaboration with local communities, with a goal of making child care available to all families. billion over three years to support early learning and child care programs consistent with the Early Learning and Child Care Framework negotiated in June 2017. Of this, BC can expect about $51 million per year for the next three years. Although the federal Framework is narrower in its vision than the Community Plan, the BC government must ensure that the available federal funds flow quickly and provide additional funds to implement a truly universal and high quality child care system in the province. We recommend an additional new provincial investment of $175 million in 2018/19 ramping up to $400 million in 2020/21 over and above the federal funds. Why do it? Investing in a system of affordable, high-quality child care that is accessible to all BC families who need it will have positive ripple effects across the provincial economy: it will take some pressure off young working families, freeing resources to pay off their student loan or to help with mortgage debt or rent costs; it will provide a good start for all BC children; it will allow more mothers to participate in the workforce, increasing tax revenues almost immediately; and it will create new jobs. BC has low female labour force participation compared to the rest of the country. The same was true in Quebec before they introduced public, affordable child care in the late 1990s—but now Quebec mothers of young children are much more likely to be working than the average Canadian mom. Universal, quality child care will enhance affordability, create employment, improve gender equity, boost the economy, reduce inequality and foster healthy child development. It may well represent the one thing this new BC government does with the single greatest impact on our province. This post is part of a series based on the CCPA’s submission to the 2018 BC Budget Consultations. The submission highlighted key findings from our research and outlined our recommendations for the 2018 provincial budget. Other posts from the series can be found here.